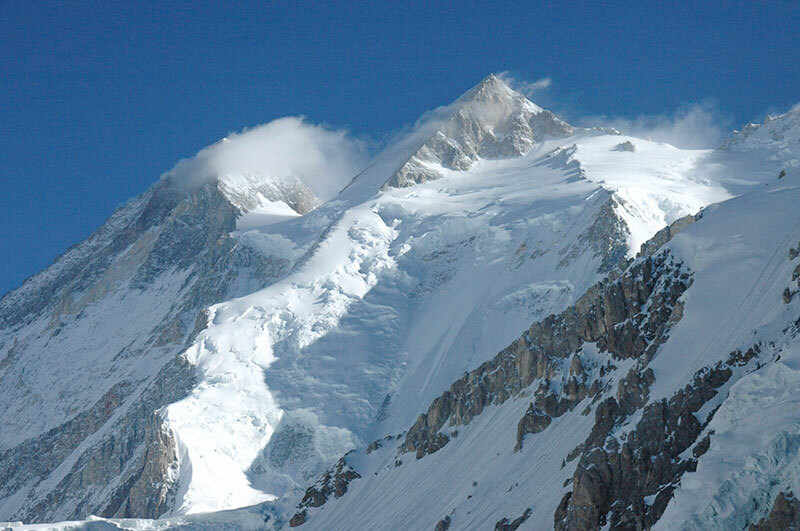 Want to learn more about climbing Gasherbrum 2, the thirteenth highest mountain in the world? Contact us today and we will give you all the info you need. Gasherbrum 2 is located in the Karakoram Himalaya, rising 8,035m or 26,362 ft. above sea level, it is the 13th highest mountain in the world. Mountain Professionals is planning a climb of the Gasherbrum 2 normal route. G2 is located in the Gasherbrum group mountain region of Pakistan and is a true Himalayan adventure on a highly sought after peak. Many mountaineers looking at a future attempt of Everest or other mountain objectives are now focusing on Gasherbrum 2 as a suitable first-time 8,000 meter peak. Our expeditions will utilize 3 camps on the mountain. Our recent experience shows that adding a mid camp 3 before the high camp, will greatly increase the summit chances for all climbers on the summit push by making for shorter movement days. Our philosophy is to approach all mountains with great care, recognizing the hazards involved in climbing high-altitude glaciated peaks. Gasherbrum 2 is one of the highest mountains in the world, posing all the risks that come with such an impressive peak. That being said, the normal route on the mountain is accessible due to less objective hazard. 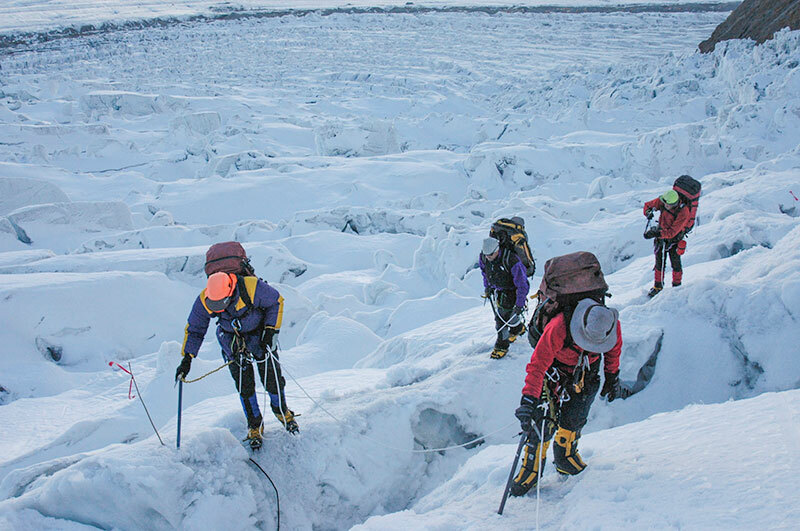 There is a substantial icefall to negotiate on the way to camp one and weather can be very challenging. We plan to utilize a highly experienced staff, top-notch safety and mountain equipment, fixed rope in exposed or otherwise dangerous sections of the route, and slow conservative acclimatization to minimize our risk. The expedition in 2019 will be organized by Ryan Waters. He has in-depth experience leading expeditions to 8000-meter mountains in Nepal, Tibet, and Pakistan. Our Pakistani logistics partners have worked in the expedition business for over a decade as a top logistics organizer and expedition management team. Our team has experience organizing multiple expeditions to mountains including trips to Manaslu, Everest, K2, Dhaulagiri, Cho Oyu, Broad Peak, Lhotse, Gasherbrum 2, Gasherbrum 1, and several 5000m to 7000m Himalayan mountains. Our on mountain climbing staff will consist of top American Mountain Guides, Nepali Guides, and Pakistani High Altitude Porters who have years of experience on the high 8000 meter mountains. Our staff work very hard to fix ropes, stock camps and assist our team in reaching the summit safely. We will employ a full cook staff that specializes in healthy, abundant and tasty meals. Our cook staff is very talented and is always ready to make our team’s experience the best possible. Good food is a priority on our expeditions and experience shows that this is a key component of success on a long 8000-meter trip. Our recommendation is for team members to have a solid mountaineering background that involves several trips to high altitude peaks ranging from 5000m to 6500m+ in elevation. Team members must be very comfortable with glaciated mountain climbing skills and living at high camps. Past experience on 7000m and 8000m mountains is a definite plus. The team will take sufficient time to rest and acclimatize in base camp prior to beginning a conservative climb to the higher camps. The location of Camp 1 will be at 5,850m. The route from Base to C1 will include rock scrambles on moraine and sections of glacier travel of varying steepness through an icefall followed by a long low angle climb over glacial terrain using rope team travel. Climbing from C1 to C2 will include longer sections of steep snow and ice, with some short vertical ice steps. The route will be fixed with rope in any exposed or vertical sections in order to maximize our safety. 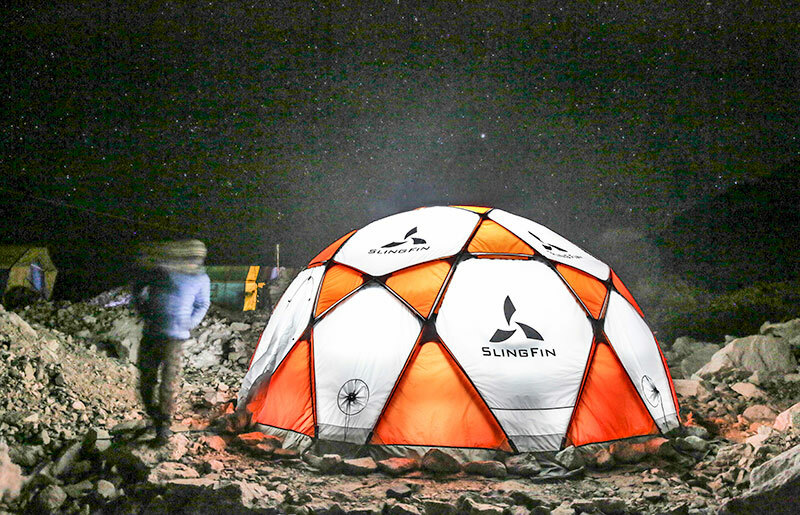 The Camp 2 is located at 6,200m and most climbers can climb their first time to C2 in 5-6 hours. A climb of roughly 5-7 hours takes us to the high camp – Camp 3 at 7,000 m. The route is moderately steep and weaves in and out of snow and ice terrain up a ridge line out to a sloping camp. Here we will rest, eat, drink, and prepare for the summit bid. The climb to the summit, while not technical, is demanding given the altitude. We will climb with our team of climbing guides and staff who will help break trail and fix rope in any locations that require an added margin of safety. Our goal… to have a safe expedition, have fun, and then to reach the summit of Gasherbrum 2, the 13th highest mountain in the world. 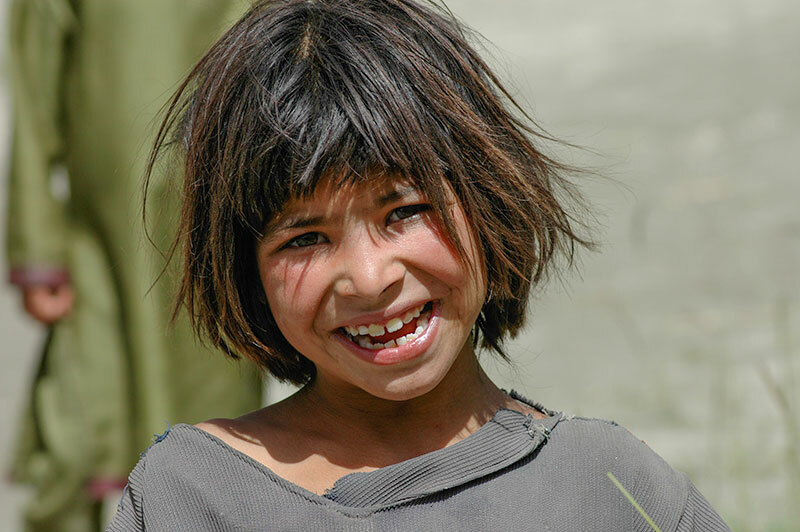 We return to the Karakoram Himalaya for the Mountain Professionals Karakoram Programs. Follow the news beginning in June, 2018. Day 1: Arrive in Islamabad. Our staff will meet you outside and transport you to our hotel in the hotel. Team Meeting. Day 2: Ministry of Tourism office for Permits. Some organization of personal gear and needs. Day 3-4: Depart for Skardu via Islamabad to Skardu Domestic Flight. Day 5: Skardu day for logistics. Day 6: Jeep ride to Askole. Day 7-14: Base Camp Trek. Day 15-16: Rest days and move into base camp. 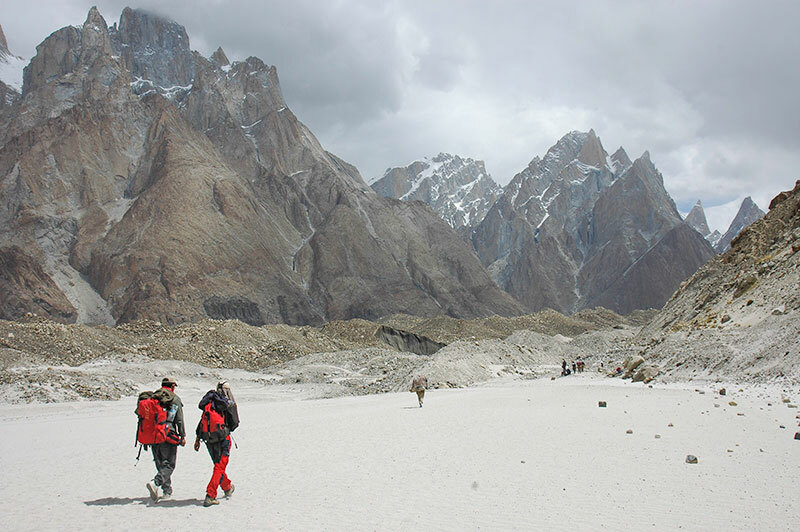 Day 40-46: Trek from Base Camp and Return trip to Skardu. Days 47-48: Return from Skardu to Islamabad via Domestic Flight. Day 49: Backup Reserve Day for Delays. Day 50: Return Date to Home Country. Nepali Sherpa and High Altitude Porter Climbing Support. Four nights shared accommodation in Islamabad. Full board on twin sharing basis on approach to Skardu. Full board on twin sharing basis in Skardu. Base Camp Trekking guides and porters. Meals throughout the Trek, Base Camp, and Mountain. All transportation in Pakistan as per itinerary. Cooks, kitchen and climbing staff; equipment allowances, daily wages,insurance, and food. Dining tent, full kitchen, shower and toilet tents, chairs and tables at BC; Espresso and Coffee, comfortable BC environment and highest quality food. Equipment allowances, daily wages, insurance, food and lodging for Liaison Officer and Interpreter. Camp satellite phone communication setup. Team Dispatches via Contact 5 Software our website. International airfare to and from Islamabad. Meals in Islamabad, outside of breakfast. Pakistan visa, airport departure tax; personal travel. Early departure costs outside our planned itinerary. Oxygen and use of mask and regulator (Available on Request). Staff gratuities for Climbing and Cook Staff.